All experiences we won’t soon forget. Let’s get into it! We arrived in Kyoto after a 9 hour drive. After an hour searching for a camp spot, we settled for a public park. It was 2am so no one was there to kick us out. In the morning however there were joggers starting to trickle in so we packed up quick and headed for the city center. On the way, we created an attack plan to hit as many awesome tourist spots as possible in one day. In a city of 1600 temples we could have spent a week, but one day was all we had! 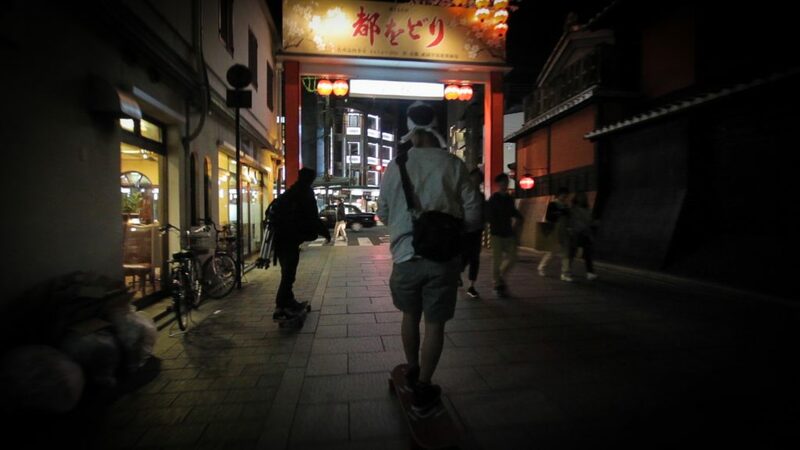 First on the list was Kiyomizaderu Temple, a 15 min skate from our car. There was a steep, tourist covered hill outside the front gate… an opportunity for a good shot. Once inside the temple it was clear why it was so popular. Huge 5 pagoda structures with intricate detail, balconies overlooking the city, and water shrines made for a beautiful setting. We found a smaller, less crowded pagoda and filmed some cheesy, samurai film style shots with our full face helmets on (stay tuned to the video series). Close by was the Fushimi Inari Shrine. 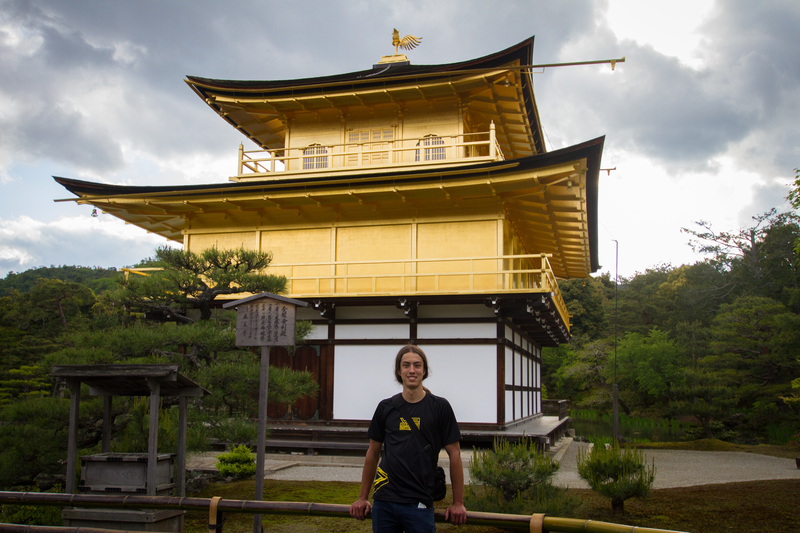 It’s a walking loop up a mountain lined with over 1000 gates, “tori” as they call them. They’re all painted red, made of wood, and give you the feel like you’re in a tunnel. After starting a conversation about camera gear, we made friends with a solo traveller from Malaysia named Fatih who joined us for the hike. We got 40 mins up the path and realized we were only halfway so we decided “500 gates is enough” and headed back down. Too many places, too little time! Fatih followed us over to the Iwatayama monkey park. Iwatayama translates to “monkey mountain” and it was exactly that. Another 20 min hike led us to a group of 20 or 30 monkeys roaming around in the open. They’re used to humans and aren’t scared to get close. This became a little scary when I forgot I’m not not supposed to look them in the eyes and one of them started howling at me. He was pissed! I thought he was going to attack me and I was only 4 feet away. 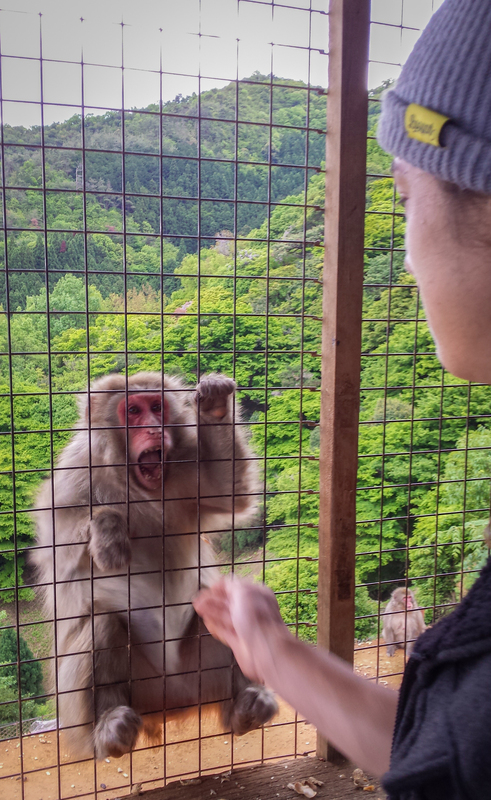 Later when feeding monkeys in the feeding cage, it must have been the same monkey because when trying to feed him, he’d aggressively grab my hand and give me the “let’s fight” face. Most of the monkeys were chill though and we even fed a cute, tiny little baby. By this point we were running out of time and had to make it to Kinkakuji temple (a.k.a. the golden pavilion) before they closed. We bid farewell to Fatih, jogged down the mountain, and started to frantically skate towards the temple. I admit, I underestimated how long and hard it would be. Up hills, down hills, sidewalks, weaving traffic, we were determined to make it. Nori told us afterwards that he had a good laugh to himself because of how crazy it was. We were on the road half the time getting buzzed by cars, passing cars, even a few tour busses, while carrying all the camera gear. Clayton was super gassed and ready to give up, but just before closing, we made it to the golden pavilion. Poor Clayton decided to sit this one out because the hard pushing gave him some painful chaffing! Nori and I continued on and the hard work was instantly worth it. This was the most beautiful temple of the day, a golden temple bordering a big beautiful pond. On top was a Ho-Oh (pokemon fans know!) the golden bird of East Asian mythology. The whole crew was super exhausted and needed food asap. Nori paid for a luxury cab to Ikishi Market where we found a restaurant to pig out on some bento boxes. At a shop close by, Clayton bought a headband with a red circle and the word “kamikaze” written in Japanese. It was hilarious watching the locals crack smiles and point as we walked by. I noticed at least 20 people laughing at him. According to Nori, this is pretty much the most stereotypically “gaijin” (foreigner) thing he could be wearing. 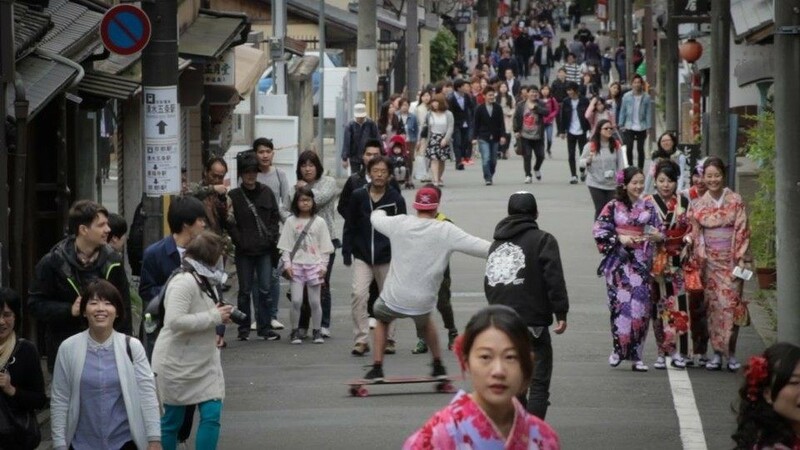 After a skate through the traditional buildings of the Gion district, we piled back in the car and started driving to the Hyogo Longboard Friendship, a jam put on by the locals. We showed up to a group of 20-30 Japanese skaters skating a closed off, dead end road and shuttling runs in a giant van. 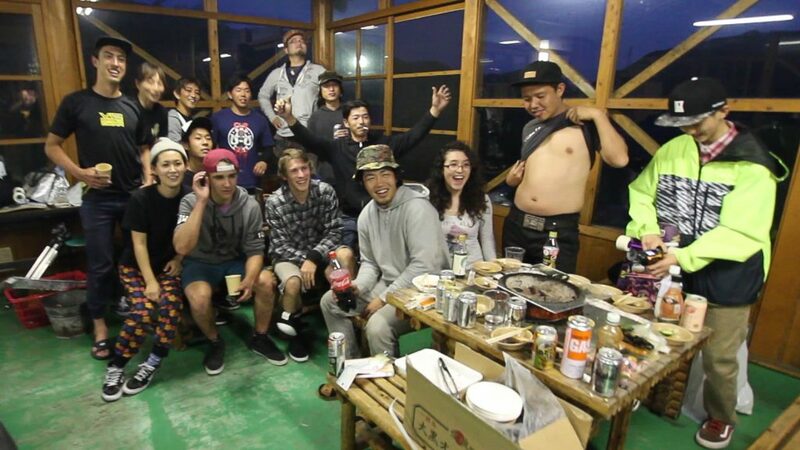 Riders of all skill levels skated together and cracked jokes with us in the best English they could. I tried my best with the Japanese, but it’s still basic at best and consists mostly of swear words and making fun of myself. 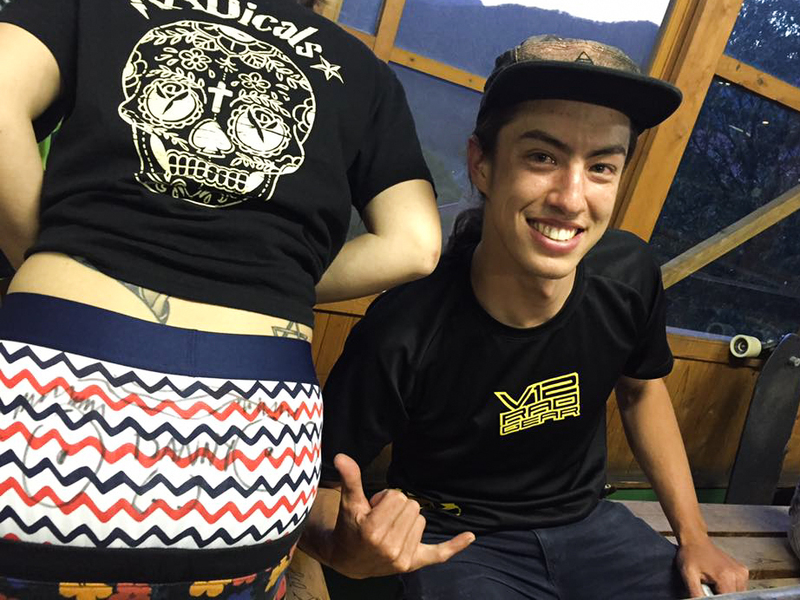 Clayton was throwing some gigantic 60km/h toeside 180s which is impressive, but to the Japanese riders, it was incredible! Every time he would do one there would be a cheer of “WOOOOOOOAAAAAAAHH, SUGOOOOOIII!” No one there had seen slides that fast and big before. The crew had a whole bunch of gear to give away and they were having “jan ken pon” matches to win. It’s basically rock paper scissors where everyone goes at once, then whoever’s in the majority moves on. The cycle repeats until one winner is made. Clayton and I decided to give away a bunch of our used wheels and started directing some competitions with the ultra enthusiastic locals. You’ll have to wait for the videos to see just how stoked they were. As we waved goodbye, a drunken Tomo falls down the grass hill and almost onto the stairs. 720 loop bridge dropping 60m on a highway. We did it at 4am!